Since its inception, Vons serves some of the most diverse, culturally mixed and affluent US communities. Its motto prioritizes the provision of high-quality services at reasonable prices. Most importantly, Vons evolves along with its clientele’s preferences. Today, it offers top class services via its banks, pharmacies, customer service centers, and dry cleaning services. Its premium Safeway SELECT services comprise 1200 private label items. Plus, Vons’ mobile app enables the placing of orders from the comfort of your home or office. Besides, Vons Delivery takes its community involvement activities seriously. In 1906, Charles Von der Ahe with only $1,200 opened a 20-foot wide grocery store in downtown Los Angeles. By 1928, when he sold his outfit to MacMarr Stores, his business included 87 stores spread all over California. Safeway acquired MacMarr Stores in 1930 and two years later Von der Ahe’s two sons restarted the grocery chain. In the next 70 years, massive growth spurred an increase of innovation in its products and services. 1948 marked its transition into a major supermarket chain in the Greater Los Angeles area. Thanks to the introduction of prepackaged products, Vons pioneered self-service for meat and deli products. In the 70s, it dominated the supermarket chain sector with its 159 stores and 16,000 employees. Safeway Inc. acquired Vons when it purchased a 35% stake with the two companies merging in 1996. Today, its operations cover San Diego, Fresno, and Nevada. Agoura Hills Anaheim Hills Bakersfield Burbank. Corona Culver City Encinitas Fontana. Fresno Granada Hills La Crescenta Laguna Niguel. La Mesa La Verne Long Beach Los Angeles. Mission Viejo Newport Beach Oceanside Redondo Beach. San Diego Santa Clarita Temecula Torrance. Ventura West Hills West Hollywood Westminster. And in Nevada, Vons delivers to the Henderson Las Vegas area. To find out if Vons covers your location, enter your zip code on its Sign In/Registration page. During official Vons holidays, there are no deliveries. Place your order before 3:30 am for same day delivery between 10:00 am and 3:30 pm. Likewise, you should schedule your 10:00 am and 3:30 pm same day deliveries before 8:30 am. One Vons customer had his order delivered within fifteen minutes. Other customer reviews are generally positive. Every day, Vons offers 1 hour, 2 hours, and 4-hour delivery windows. Save money using its 1-hour windows (marked Save $) or its 4-hour window (marked Green). All deliveries occur between 9:00 am and 10:00 pm local time, seven days a week. However, delivery times vary between stores. So, before scheduling a delivery, check out its availability. Click the Checkout button to do so. All listed delivery times are local to your location. Vons charges $12.95 for purchases under $150. For purchases worth $150 and above, Vons charges $ 9.95. You are required to make a minimum order amount of $49. All first time customers enjoy free deliveries. Its regular home delivery fees exclude bag fees, fuel surcharges, delivery fees, bottle deposits, and applicable taxes. For average gas prices between $2.76 and $2.85, its surcharge equals $0.28. For average gas prices between $2.86 and $2.95, its surcharge equals $0.38. Plus, an extra surcharge of $0.10 for any additional increase of $0.10 in gas prices. To qualify for Vons FREE delivery, enter the Promo Code EASY7 when checking out an order. Link your Vons Delivery account to your Club Card to enjoy exclusive savings anytime you shop at Vons.com. Club Card membership simplifies the saving process. Always show your Club Card when checking out to leverage these benefits. Savings are deducted automatically and reflect on your receipt. But what if you forgot your card? Simply provide your phone number to claim your savings! Leverage Digital Coupons to Make even more Savings! Use Vons Delivery Digital Coupons to save more! Any coupons you collect from Vons’ partner site are automatically added to your Club Card. As a result, you don’t need to carry any paper coupons when shopping or placing your orders! Vons partner benefits are automatically downloaded into your Club Card! This is why you need to apply for a Vons delivery Club Card. What if I Need to Deliver Gift and Floral Cards? Vons has a flower shop that offers flower and gift cards. Use it to deliver the perfect combination of flowers or gifts to make any occasion memorable. No matter whether it’s Valentines’ Day, Mother’s Day, baby gifts, or anniversary flowers, Vons Delivery gets you covered! 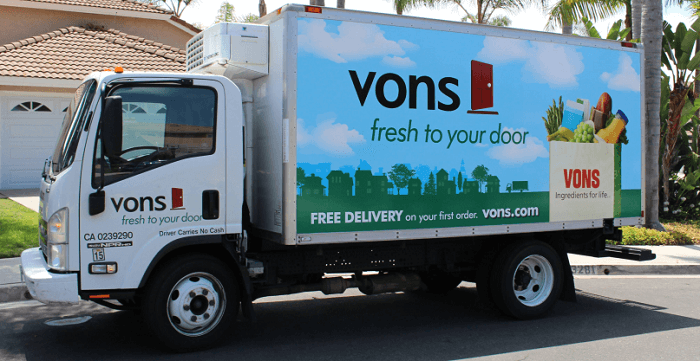 If you are looking for a top class home delivery service, you can depend on Vons Delivery! With its innovative services and products, you can reduce the number of visits you make to the grocery store. Most importantly, you get to enjoy premium discounts, fast rate delivery services, and support as well. Ever shopped online or used a home delivery service? Leave us a comment below about your experience! Hey Buddy!, I found this information for you: "Vons Delivery 101: Areas, Hours, Fees". Here is the website link: https://all2door.com/vons-delivery/. Thank you.